Our Country Chronicles: Happy Halloween!! From a beautiful princess and an adorable chicken! And isn't this just the CUTEST thing you've ever seen?? But wait! It gets better. . . Check out her candy bucket!!! I have to tell you, this costume got Soooooooooo many compliments!! I wish I were so creative to have made this. The hat and feather boa shirt was from my girlfriend Carolyn. She made this for her son several years ago. The pants were fleece and warm, and made for Madeline by my niece Shannon. 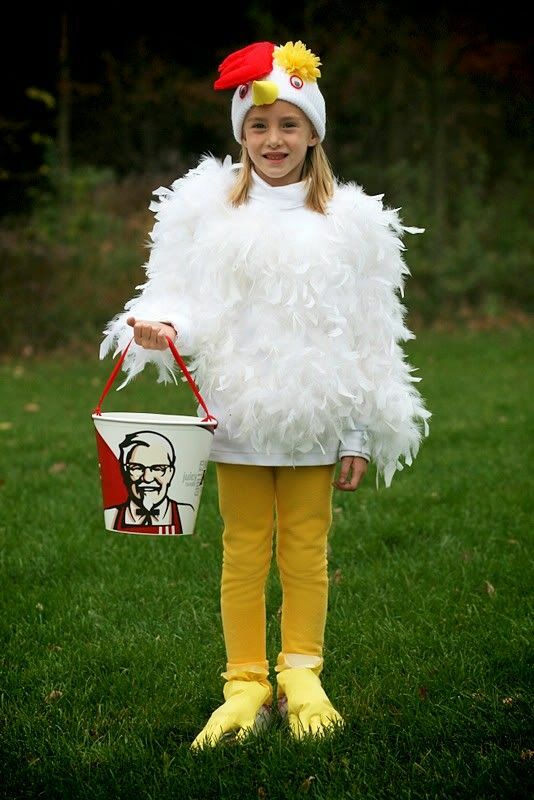 Really, the only thing I can take credit for are the rubber glove feet, the flower on the chicken head (she wanted everyone to be sure she was a "hen"), and the KFC bucket. But I do so love this costume. It is my favorite all time. We even had several people stop to take a picture of her!! It was great. Thanks Shannon and Carolyn! 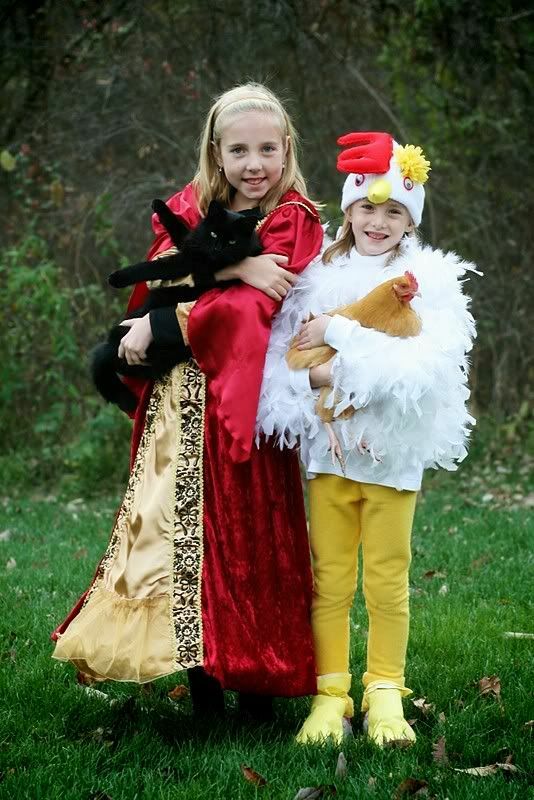 Madeline really got in tune with her inner chicken as she bawk-bawked often to the people who gave her treats, to which she got many smiles and laughs. Isn't that just like a chicken??! I LOVE the chicken feet! Great costumes and they both look awesome!! Thanks Lori. 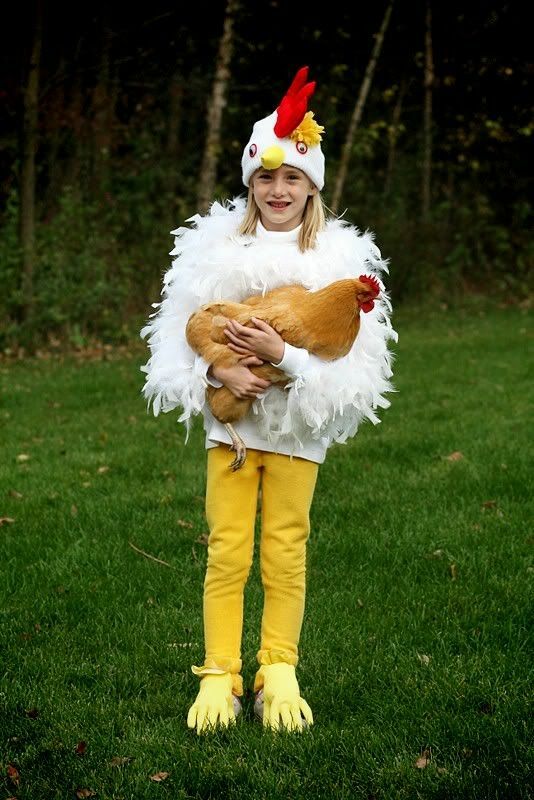 Carolyn loaned me the chicken costume!! Kelly -- your photos ALWAYS make me smile! What awesome costumes, what beautiuful little faces! Rebecca-The little touches made the costume. People loved the KFC bucket. I had to go to two KFC's before someone would give me one. Can you believe it? The first one I tried refused. I told them "You realize we will be going door to door and offering you FREE advertising in the process. . .". Some people are just unable to THINK!